16/22 Amanda Jones A step up from the last film, to be sure, but still a miss. 25/48 Kim Hollis Rollicking fun and a fitting end to the trilogy. It's great to have Geoffrey Rush back. 33/46 Les Winan Still generally enjoyable, but so convoluted you can't help but wish they'd stuck to the simple fun of the first film. Far too long. 51/214 Max Braden Takes a long while to do what it wants to do, but I liked how there was more story to this one than the second. The music doesn't serve this one as well as the first movie. Multiple Jacks distract. Captain Jack Sparrow is really up against it this time. After years of skirting disaster due to his celebration of the pirate lifestyle, the movie-going world’s favorite no-good-nik has finally gotten his comeuppance. A betrayal from a woman he may love, Elizabeth Swann, has placed him in an awkward position. Specifically, he has found himself staring into the gaping maw of the legendary beast of the sea, The Kraken. Handcuffed to a post by Swann, Captain Jack has no way to run and nowhere to hide as the not-so-mythical monstrosity prepares to slowly engulf the pirate and send him on his way down to Davy Jones’ Locker. 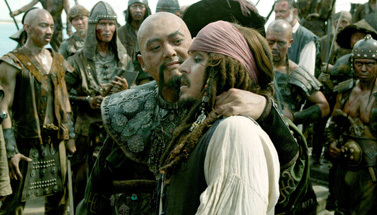 This is how $1.06 billion in ticket sales worth of movie-goers last saw Captain Jack Sparrow ten months ago. His exploits in Pirates of the Caribbean: Dead Man’s Chest were so anticipated that the film attained a record-shattering opening weekend of $135.6 million, over $20 million more than any prior movie had managed in a three day weekend. The original swashbuckling tale of Sparrow, Swann and pirate-in-training Will Turner was the surprise hit of the summer of 2003, earning over $300 million domestically with a grand total of $653 million worldwide. The first film in Disney’s franchise re-launch of their beloved theme park ride, Pirates of the Caribbean, was a stunning success story yet only three years later, the sequel beat that world-wide revenue total by a whopping $410 million, an improvement of 63% from the fourth largest movie of 2003. For accomplishing all of these staggering box office feats and becoming the third most successful movie of all-time world wide, Dead Man’s Chest was chosen by BOP as the top industry story of 2006. So, where does the franchise go from here? This is the question for which millions of people are excitedly awaiting an answer. Disney has been tight-lipped about what should be expected, but the trailers and other publicity for the movie emphasize a few key points. The first is that Sparrow is back despite being an afternoon snack for the Kraken. That one is unsurprising. The other is the surprise given away at the end of Dead Man’s Chest: Barbossa might have been run through at the end of Curse of the Black Pearl, but that didn’t permanently kill/re-kill the former skeletal warrior. The third is that Sparrow and Barbossa will not be the only pirate captains. In fact, the four most powerful swashbucklers in the world will join up with Turner, Swann and Barbossa in their quest to save the legendary Jack Sparrow. See the latest developments for this project on the Pirates of the Caribbean: At World's End Movie News page.